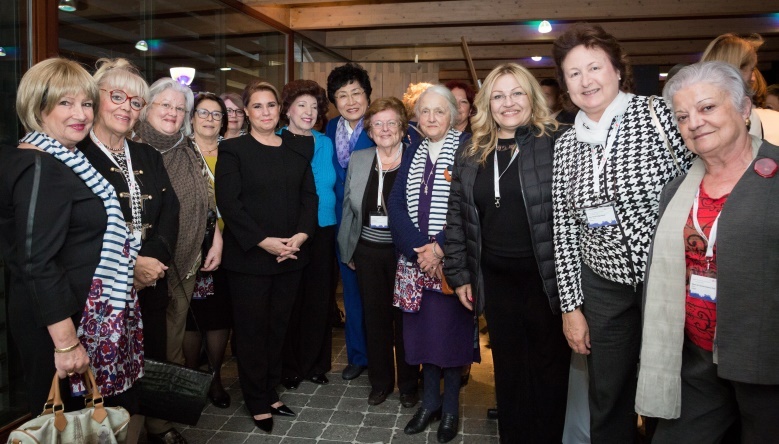 General Assembly of the European Centre of the International Council of Women and conference <Women and men in decision-making process> organized by the Ministry of Equal Opportunities and the National Council of Women of Luxembourg were held on 15 -16 October, 2015. The small state of Luxembourg has a long experience of integration within bigger entities in Europe after World War II. It joined successively the Benelux, the CECA, the Common Market, the European Community and finally in the European Union. As such the Minister of Equal Opportunities together with the National Council of Luxembourg convened a meeting last October with the small states in Europe, San Marino, Malta, Andorra, Monaco, Lichtenstein, Cyprus, Iceland and Luxembourg, all small countries which were able to maintain along the centuries their independence meanwhile keeping tight and traditional relations with the bigger countries. San Marino and Andorra showed their interest in joining ECICW. National Councils of Malta and Monaco despite their small population were in the recent past extremely active in the frame of ECICW. It proves once again that it is not so much the importance and the power of a country when it is about to be active with ECICW, but indeed the personality and the commitment of the presidents of those small NCW. Malta and Monaco hosted ECICW meetings several times and now Luxembourg. I express my gratitude for the generous hospitality of the Ministry. Our gratitude also goes to the NCW President Claude Wolf, to our General Secretary Joëlle Letsch and to the organizing team of the NCW Luxembourg who set up for the first time in the ECICW history a meeting with the small states. Besides the NCW together with Mrs Lydia Mutsch, Minister of Equal Opportunities organized a seminar on the Gender Equality in the decision making process with distinguished speakers. We were honored with the presence of the Grande-Duchesse of Luxembourg. Besides the Secretariat of the NCW Luxembourg together with the ICW financial help were able to invite 2 Palestinian ladies, Fatima Faroun and Antoinette George Knesevitch upon the suggestion of the ICW Coordinator for International Relations and Peace Mazal Renford from Israel. This gesture symbolizes the ICW and ECICW commitment for the struggle for peace precisely when the conflicts in Europe and Middle East are in a situation of acute crisis. ECICW is extremely preoccupied by the continuous flow of refugees from Syria and Afghanistan during the last months. Among them the most vulnerable are certainly women and children. All men and women are trying to reach Europe hoping for a better life. One cannot blame them. The European governments are confronted by the lack of common policy and the weakness of the commitments taken by the Schengen Agreement about the abolition of the external borders of Europe. As NGO ECICW was doing its job by passing a Statement about the refugees, urging the governments of the European Institutions to take appropriate measures to provide asylum to people who can be reasonably considered as victims of conflicts due to dictatorship and absence of good governance in their own countries. This Statement was proposed by the NC of Spain and unanimously adopted by the audience. By doing that ECICW has no intention to try to identify the responsibility of several nations in the intensification of the war in Syria, in Turkey, in Lebanon or a couple of months ago in Ukraine, but it is our duty to protest against any violation of human dignity and to provide the intercultural dialog. National Council of Ukraine sent to ICW and to ECICW an Appeal remembering the disaster of Tchernobyl and the commemoration of the 70th Anniversary of Hiroshima and Nagasaki. ECICW has here again the occasion to state that we are against the use of any nuclear weapons. The President of the NCW Ukraine wanted us also to remember all the victims of the conflicts between Ukraine and Russia wherever they come from. We are not taking party however for fear of losing our neutrality and credibility. Among other issues, the General Assembly of ECICW was informed that at the Council of Europe the theme of “surrogacy” is a becoming burning issue discussed at the INGO Assembly. ECICW cannot accept this principle which has definitely an ethic sound. NCW Germany evaluated in its Newsletter the modest subsidy the German government intended or is intending to provide to mothers who prefer to stay home for their children instead of taking a job. Like the” Deutscher Frauenring” ECICW believes that Equal Pay will never be a reality if women stop working for a while. It is better to promote systems which conciliate work and family. In conclusion ECICW was pleased to accept the invitation of the National Council of Women in Russia to hold its Spring Meeting in Moscow on May 18-22, 2016.